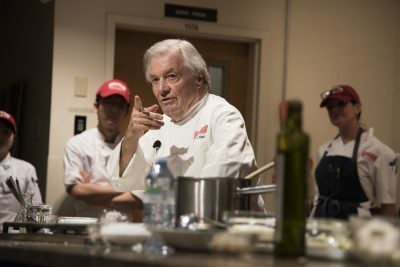 World-renowned French chef and 16-time James Beard award winner Jacques Pépin hosted a demo dinner through Boston University’s Metropolitan College Programs in Food & Wine on Wednesday night. Pépin demonstrated recipes from one of his many classic cookbooks, “More Fast Food My Way,” and told stories from his decades of cooking experience to 100 guests. Pépin, 82, was one of the founding chefs of BU’s culinary arts program almost 30 years ago, along with Julia Child and founding director Rebecca Alssid. “Their vision was that people who study food should know food from both positions — both the history of food but also from the hands-on experience of food as well,” said Potter Palmer, director of Food & Wine Programs at BU. Pépin’s years of experience include serving as the personal chef for three French presidents, running the kitchen of the Howard Johnson hotel chain and writing more than 30 cookbooks. The dinner was hosted in celebration of his latest book, a collaboration with Sur La Table called “My Menus.” The book consists of Pépin’s hand-illustrated menus from his years of cooking for friends and family, alongside blank pages so readers can create their own memories. Pépin said he and his wife of 52 years started writing down the menu whenever they had people over for dinner, and they had their guests write down their memories as they happened. He now has 12 big books of menus spanning more than 50 years. For the seasoned chef, menus have become a portal into the past. “I can see what my daughter ate for her fourth birthday, or see what we ate when my mother came, or my brother or people who have disappeared,” Pépin told The Daily Free Press. Pépin is also a passionate artist. He painted an original menu for Wednesday’s event to complement the food, which included classic French dishes like croque monsieur and apple tarte tatin. Pépin also served seafood chowder and a roast chicken with a mustard crust. Pépin comes to BU every semester to run a workshop with a group of 12 culinary students who are in an intense 14-week program. The dinner was a chance for Pépin’s students to learn his recipes and prepare them for a crowd. 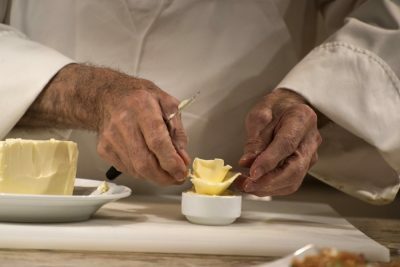 Master chef Jacques Pépin prepares a butter rose during his cooking demonstration and dinner. The demonstration room in BU’s 808 Gallery featured two portraits, one of Pépin and one of the late Julia Child. Pépin said he met Child in 1960 and was “good friends” with her for half a century. They starred in a PBS special in the 1990s called “Cooking in Concert,” which was filmed at BU, and Pépin was also the first recipient of the Julia Child Award.